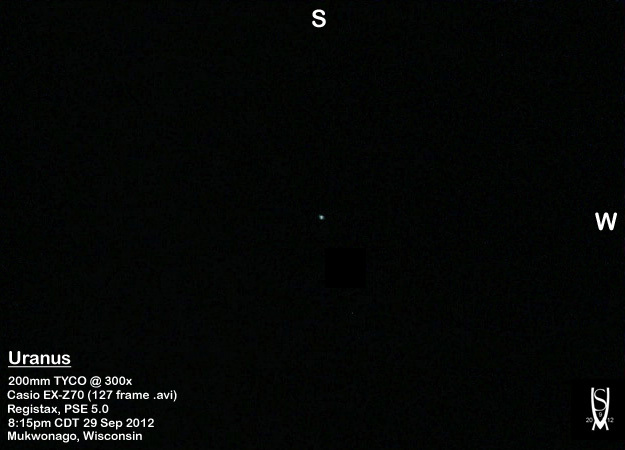 So tonight I took the TYCO out after sunset and tried to capture images of the Harvest Moon and Uranus (which was a little south and east of the moon). I quickly got everything set up after the scope had cooled down for about an hour. First up I wanted to try my hand at the Moon (I’m still processing those images, so it may take a while to post something here) and after I got my fill of drinking in the majesty of a full moon, I took a handful of movies and still shots with the Casio and the adapter I built. 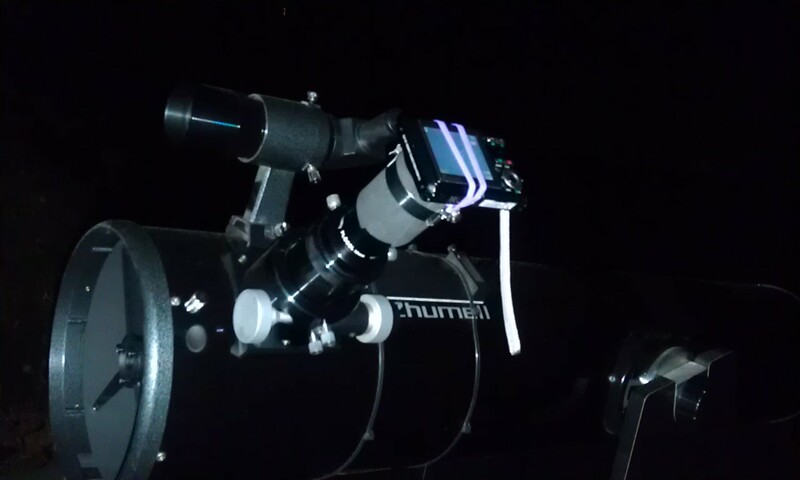 Here’s the setup: The TYCO, pointed at the Moon, a 9mm eyepiece installed with the adpater attached to that and the Casio attached (green rubber band off some asparagus!) that. It looks impressive all set up in the dark, right? After a while, I decided to try for the main event and slewed down towards where Uranus ought to be. It took a good while because the glare from the moon was washing out the image in the spotting scope, so I had to kind of blindly look around with a wide 32mm eyepiece in the Yard Cannon till I found that round blue “star”. In PSE5 I had to adjust the usual, levels, brightness, contrast, etc., then give it the tiniest shot of blue to turn the gray ball into the exact hue of blue-green that I saw visually. I’m quite pleased with the result, as it took minimal processing and kept things true. I hope the clear skies and excellent seeing continue through tomorrow morning…the ISS is supposed to pass overhead at magnitude -3.0 and I want to try my hand at Jupiter in clear conditions. ← Update: I captured Ganymede’s shadow!